In order to determine the behavior of a clock, it is necessary to compare it with another clock which is at least as stable as the first clock. The comparison of the time provided by remote clocks is called "Time Transfer"; it provides at each epoch the synchronization errors between the clocks. The comparison of the frequencies provided by remote clocks is called "Frequency Transfer"; it provides the evolution of the synchronization errors between the clocks (it is the derivative of the time transfer). The atomic clocks around the world are presently compared using two main techniques: Two-Way satellite time transfer and GNSS time and frequency transfer. The Royal Observatory of Belgium concentrates a part of his research to the GNSS time transfer, i.e. the comparison of remote atomic clocks using atomic clocks of the GNSS satellites as reference. Figure 1. Schematic view of GNSS time and frequency transfer. The principle consists in connecting the atomic clocks that we want to monitor to GNSS receivers. Then, analyzing the GNSS observations, it is possible to determine the synchronization error between the clock connected to the GNSS receiver and the satellite clocks. As the GNSS provides in the navigation message the synchronization errors between the satellite clocks and a reference time scale, one deduces the synchronization error between the clock connected to the GNSS receiver and the reference time scale of the GNSS. 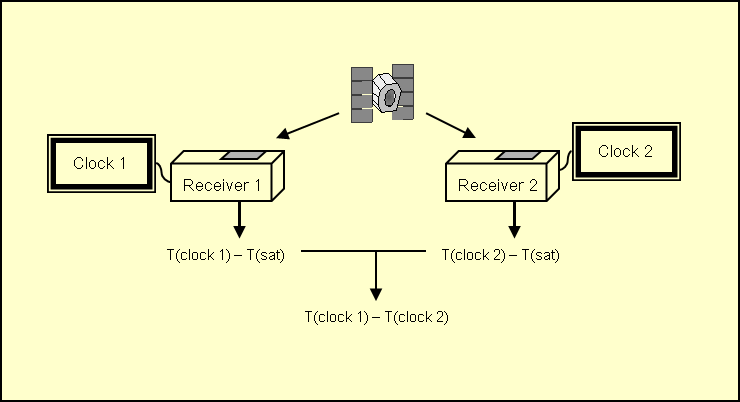 Doing this with two clocks located in two remote laboratories, one obtains the synchronization error between the two clocks as the GNSS reference time scale is the same for both. This is illustrated in Figure 1. The goal of our research is to use the GNSS signals in an optimal way in order to improve both the precision and accuracy of the clock comparisons. The accuracy of the time transfer is given by the knowledge of all the signal delays in the GNSS equipment: cables, antennas, amplifiers, receivers. These must therefore be studied. The present accuracy of GNSS time transfer is at the level of 2-3 nanosecond. The precision is mainly given by the precision of the GNSS carrier phase measurements. These data must however be corrected for all perturbations (troposphere, ionosphere, multipath, hardware delay variations) with the highest possible precision. Any uncorrected (or bad-corrected) error of the GNSS signal would be transferred on the computed clock synchronization errors, and the clocks could then not be correctly compared. A software was developed at the ROB for high precision time and frequency transfer using the Precise Point Positioning approach. See Atomium. Using this method, the atomic clocks can be compared with an uncertainty of about 0.1 nanosecond. Using GNSS time transfer, the clocks of the time laboratory of the ROB are compared with other atomic clocks in the world and integrated to the computation of the Temps Atomique International (TAI) generated by the Bureau International des Poids et Mesures (BIPM) in Paris. For more information concerning the time laboratory of the ROB, click on this link. Journal of Advances in Space Research, volume 47(2), 265-275, 2011. Metrologia, 47 (3), 305-319, 2010. GPS solutions, 14(3), 267-277, 2010. Intern. Journ. of Navigation and Observation, Volume 2008 (2008), Article ID 175468. GPS solutions, 11(4), pp. 239-249, 2007.
metrologia , 40, pp. 184-188, 2003.